Overall turnover swelled by double digits since the last survey period, with swaps undergoing the largest growth. 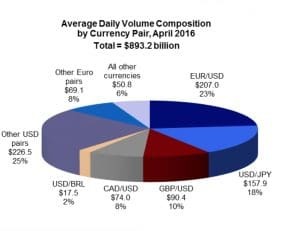 The Foreign Exchange Committee (FXC) has reported the results of the 24th Survey of North American Foreign Exchange Volumes, which captured the period of April 2016 – amongst many notable findings were a growing over-the-counter (OTC) average daily volume (ADV) for FX instruments, with turnover also on the uptick, per recent survey findings. The FXC includes a composite of representatives across major financial institutions engaged in foreign currency trading in the United States. The survey itself was originally developed in order to provide market participants relevant information on the size and structure of FX activity in North America. During April 2016, ADV of OTC FX instruments, which includes spot, outright forward, foreign exchange swap, and option transactions came in at $893.2 billion, up over 10.0% relative to the October 2015 survey period. Looking specifically at the latest tranche of data, the largest increase in ADV during the April 2016 survey as seen across swaps, relative to April 2015. Moreover, swaps constituted a larger percentage of FX market share, growing from April 2015 – by extension, forwards and swaps declined slightly over the same period. Overall, the increase in swaps turnover was quantified at 23.0% in the latest April 2016 survey. Furthermore, average daily turnover in spot, forwards, and options also grew by 7.0%, 8.0%, and 3.0%, respectively over the same timeline. Finally, in terms of turnover, volumes relegated to reporting dealers and nonfinancial customers was pointed lower in the latest survey, falling -11.0% and -8.0% respectively. While the EUR/USD continued to dominate with the highest proportion of the composition of the trading market (23.0% and $207.0 billion despite losing -4.0% in volumes), the USD/JPY currency pair grew by 35.0% from the previous survey, justifying $157.9 billion or 18.0% of the market. The GBP/USD was a distant third, yielding $90.4 billion or just 10.0% during April 2016 – however, turnover volumes of the GBP/USD also jumped 15.0% over the same period. The survey can be read in full by accessing the following link.